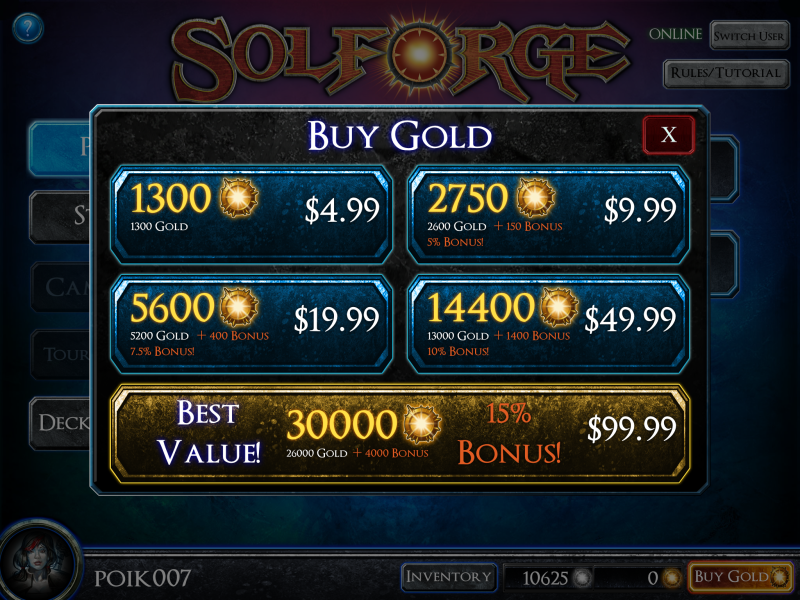 SolForge is a trading card game that would be tough to make in real life. 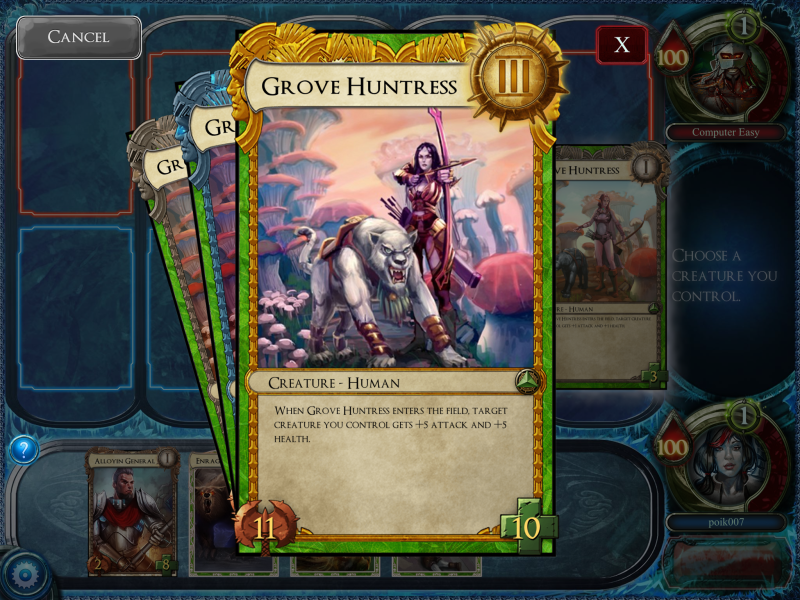 A bit like Scrolls, it uses counters (you increase and decrease stats permanently quite often in this game, compared to Magic: The Gathering where creatures don't keep their life totals dynamic every turn) and a grid-like playing field. There's an interesting level-up system where cards you play can come back as leveled-up versions of themselves after a few turn, making you pick the cards you want to evolve over the ones that are useful right then. Ultimately, I find it light in content and without reasons to play it before future updates. Picking up cards from four different factions (but not more than two at the same time, which is interesting) you build a 30-cards deck of creatures and spells. Creatures have attack and defense and sometimes special abilities, spells can do a variety of things. Then you play two cards per turn (or one if you started), on a grid, creatures attack the row in front of them (after a turn of summoning sickness) and you go that way until someone lost all their life. I find it weird that there isn't any restriction on super powerful cards. You can just stack your decks with mythical and rare cards and play them, your 'common' creatures with no special abilities aren't balanced to be relevant past a certain point. Magic has mana costs to throttle that, maybe rarer cards should be limited in quantity? I love the card evolving mechanic, the cards you play get better the next time you draw them, the ones you don't play just come back as-is, so you're encouraged to not just play the same strong cards over and over because you'll be left with a bunch of level 1s. Some of them are useful, but the higher levels are just plain better. Some cards are better played in a specific sequence or in specific spots on the grid, maybe the game should warn you about that in some way or if you have hints enabled. Playing a creature that gets powered-up everytime you play a creature BEFORE your other cards is a dumb mistake, as in playing a card that boosts everything if it's on the middle column in the wrong one. The tutorial is okay but cards could have a few hint here and there. You can also buy boosters and some of them can only be purchased with 'premium' gold, that's a way to make money but I wish you could also buy them with really high amounts of silver, oh and also make every game give silver. Why not give silver for getting 'achievements' too? Taking away 30 health in one turn, playing five human cards, finding reasons to give incentives to the player to keep playing? 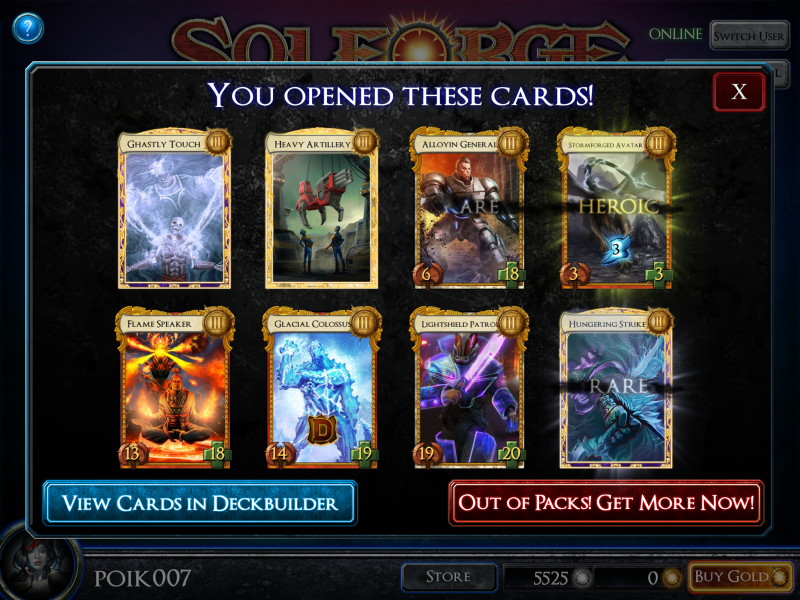 It's what frustrates me the most about SolForge; The base game is okay but there's not much reason to play it. 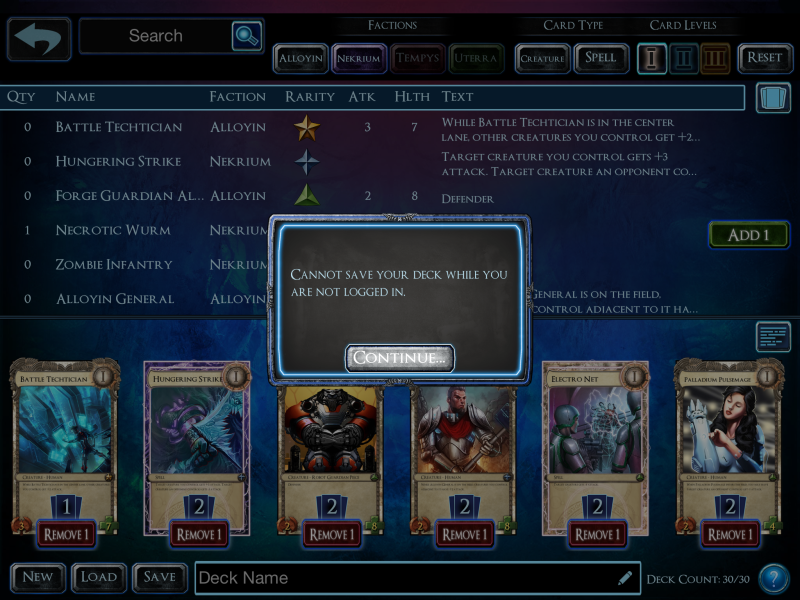 The iPad version is also a bit busted; the controls to select cards and move between the 3 levels are easily misinterpreted as something else, and the fact that you have to sign in to save your deck but can build your deck and won't be warned beforehand is also a bit strange. At least SolForge is free right now.